The term aqua vitae, or "water of life," stems from the days of Roman Empire. If a soldier was in pain, a healthy dose left him feeling quite fine. 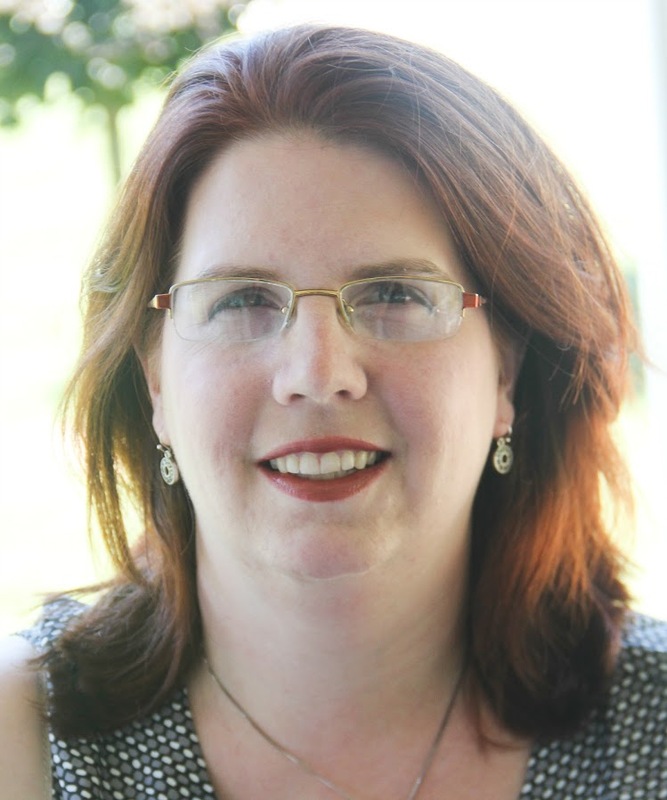 Poured onto wounds, it literally saved lives as it kept infection away. It was around the Middle Ages, the term became synonymous with distilled spirits, such as brandy. Every country and language has it's own native spirit: the grain-based Gaelic uisce beatha that we call "whiskey", French eau de vies made from fruits and nuts, especially the popular apple-flavored Calvados brandy, traditional Russian vodka made from potatoes, and the German kirschwasser, or "cherry water." When Luke was taking his cooking classes, one of the sections specifically discussed "desserts for grownups." One of the recipes was for "Bachelor's Jam" - a concoction of summer fruits that are layered with brandy and left to ferment through the fall, then served with light cake. Since it's currently spring (or so says the calendar -- the weather hasn't quite gotten with the program), there aren't any overripe fruits to ferment with brandy yet. We opted to turn some frozen cherries into sorbet. It's an equally simple dessert - only five ingredients - but one that will impress guests. Kirschwassser is a German distilled brandy made from fermented cherries -- think cherry wine that has been further refined. This clear spirit has more of a cherry "aroma" than flavor. Kirsch is very popular as an ingredient in fondues, black forest cake, and cherries jubilee, as well as both an aperitif (before-dinner drink) and digestif (served after dinner). It's very strong - usually 90 proof, or about 45% alcohol) and not sweet at all. When I first tasted it, I was expecting something closer to amaretto than moonshine! Perhaps kirschwasser served neat is a bit of an acquired taste, and I just have yet to acquire it! However, as an ingredient, it is much softer. The spirit bring out the alcohol-soluble flavors in the cherries, and boost their sweetness without making it cloying. Lemon juice provides acidity and brightness. We froze ours in an ice cream machine and then let it set in the freezer to make a sorbet, but even just churned from the machine makes a darn good adult cherry slushy. In a smalls saucepan, heat sugar and water until sugar is dissolved. NOTE: If you are using a machine like ours that has a built-in freezing compressor, you can continue immediately. If you are using one that has a put-in-the-freezer-first bowl/core, refrigerate the syrup until cold. 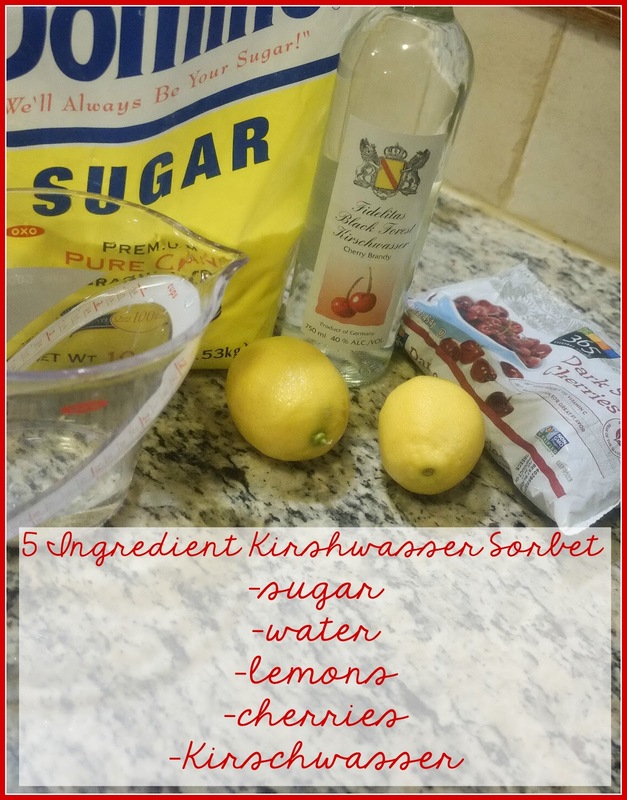 Place cherries, Kirsch, and lemon juice into a blender. Add the (cooled) sugar syrup, and puree until smooth. Luke says, "NOTE TO SELF. 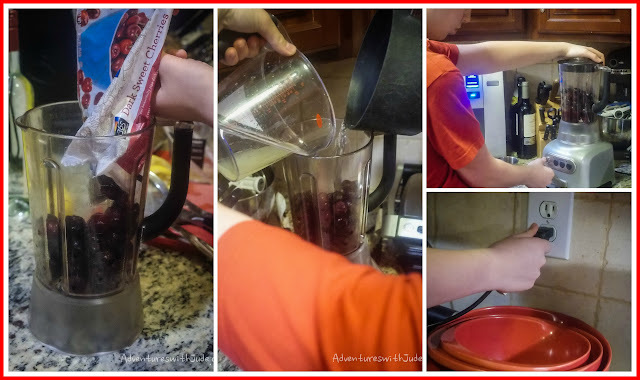 Blenders work better when they're plugged in!" 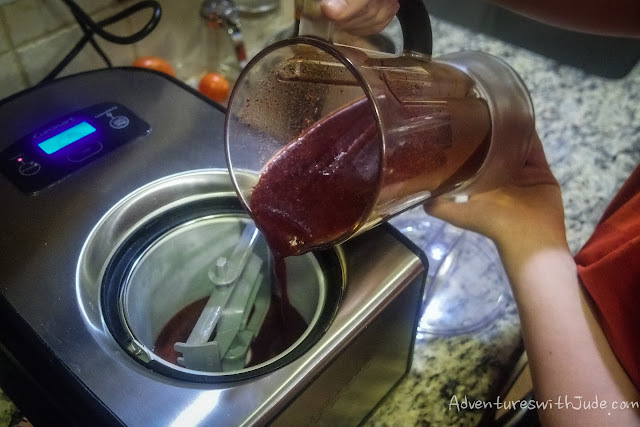 If you're using frozen cherries, you can probably go directly to the machine, but if you're using fresh ones, chill everything down about 3 hours. Pour into your ice cream machine and follow the manufacturer's instructions for freezing . Ours took about 40 minutes to churn. After it's frozen, either serve immediately (it will be very soft) or put in a covered bowl and freeze until firm. If you don't have an ice cream machine, you can make a granita-like desert. 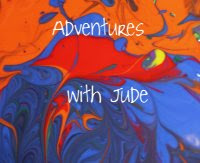 Place the puree into a 9x13 glass dish and cover with plastic wrap. Freeze for about an hour, or until the edges are firm. Stir, and return to the freezer for about 2-3 hours, stirring every half hour or so. If you want an icy dessert, serve directly from the dish; if you'd like yours smoother, put it back in the blender and puree for a minute or two. Serve this as an intermezzo, dessert, or digestif. 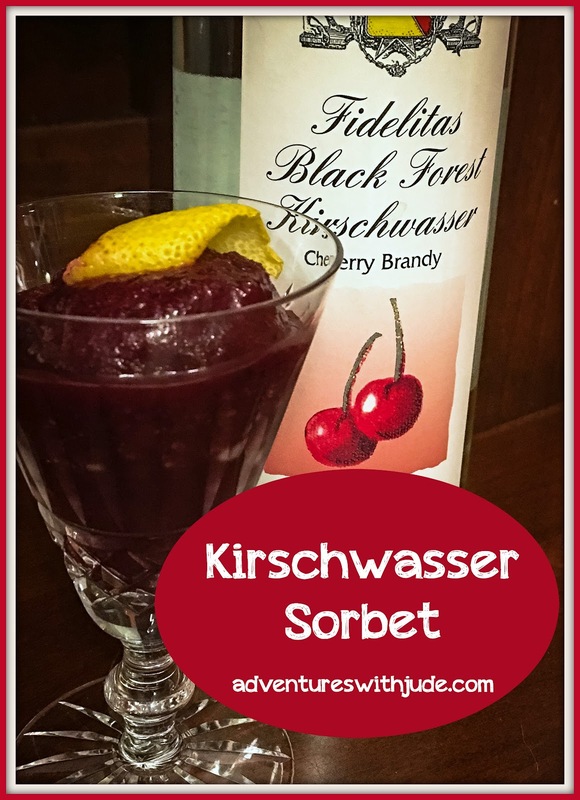 Kirsch is so potent that it is only served in 1-2 ounce pours, so with a whole cup in this recipe, you don't want to dole out large bowls! It might seem a little stingy to serve tiny demitasse-sized cups or glasses, but believe me -- much more and your guests may be wobbling from the table!